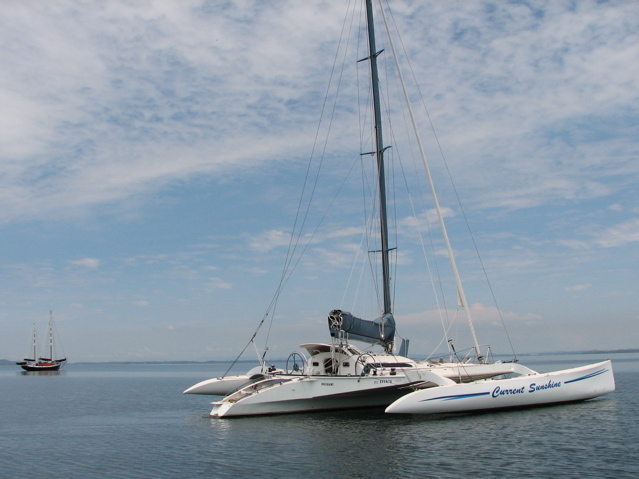 Type of vessel – trimaran. The previous insurers are no longer in the business of insuring trimarans but OAMPS, my broker, have found a new insurer for me. But they want an out of water survey report, which turns out to be not as easily done as it would have been back in Queensland. Most slipways do not have enough clear width to be able to haul her out — cos she’s a whopping 36ft wide. The typical new style of “slipway” are not a slipway at all but a straddle-lift and these can usually big enough to take a 20ft or 26 ft maximum width. The really big ones are horrendously expensive. So what I need is a old style slipway, with rails, and with good clearance on each side. And those that I did find that had enough clear width also have four tall arms that are used to snugly hold the boat on the cradle as it is being hauled out. These arms are usually too tall for Current Sunshine to float over the top of and so they have to be removed. Which requires a crane and maybe a day’s work to do. Again making it unreasonably expensive to haul her out just for a survey. But she is just about due for antifouling and maybe if I can find a yard whose arms are easy enough to remove, and do the antifouling as well, perhaps it can be ok. The best chance was at Lovetts Bay Boatshed and Michael Rich there went to a lot of trouble to have drawings done of the cradle with Current Sunshine on it to verify that it could be done. But even so the cost would be high for arm removal or adaptation, and I was beginning to run out of time. Putting it on the beach was looking increasing attractive. I’d never done this before, and even though it should be perfectly easy to do, I was still a bit apprehensive about, mainly because I’d never tried it before. It would mean I still have to find a way to slip her another day for antifouling, but at least it gets the survey done. 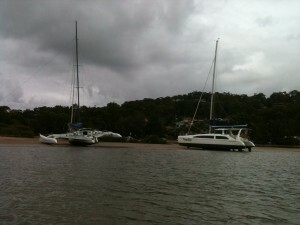 One last call to Lovetts Bay Boatshed. Michael has another plan, which might make it a reasonable cost. But he still has to double-check measurements, and it could be a day or two before we know if it can be done. But the next few days have perfect tides for putting her on the beach, and the next two days weather forecast is for very light winds in the mornings. Perfect conditions for careening which I can’t let go by. You can see from the photos she dries out nicely on the beach with hardly much heel at all. And its still quite easy to attend to important tasks such as putting the kettle on. 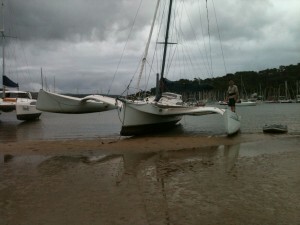 The survey was done comfortably and we just need to wait now for the mornings high tide to take her off again. The night was still and I slept well even without the usual gentle rocking. 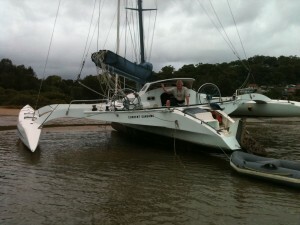 I set up a stern anchor well off in deeper water and with three lines bent together. I stretched the lines so there was some tension on — tending to pull her off the beach. As soon as she floated in the morning, the stretched lines pulled her off and out into deep water. The early morning was so still that she did this herself without the slightest help from me. All that remained for me was to pull in the anchor and ghost back to the mooring. 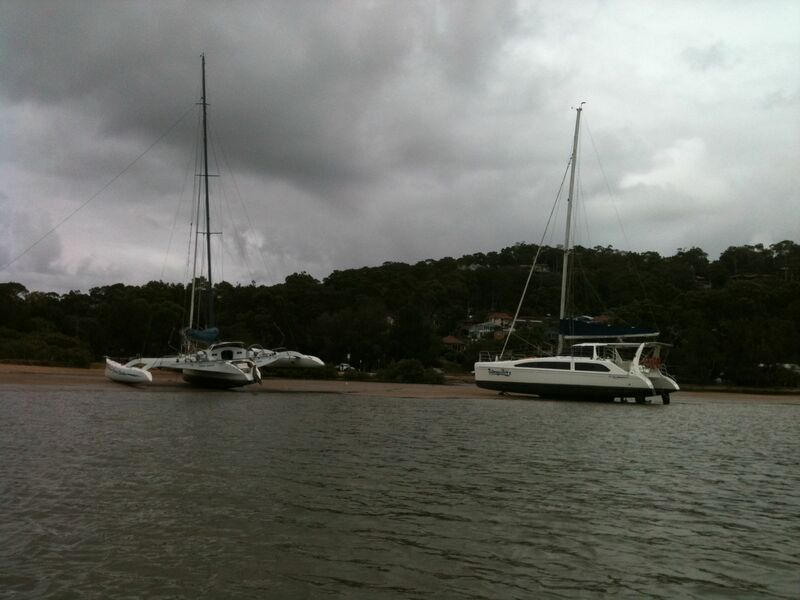 The tidal flats at Bayview are ideal for careening and popular with with catamaran owners to attend to out of water tasks. Perhaps careening is not quite correct these days because its associated with doing serious work such scraping the bottom or caulking the seams. 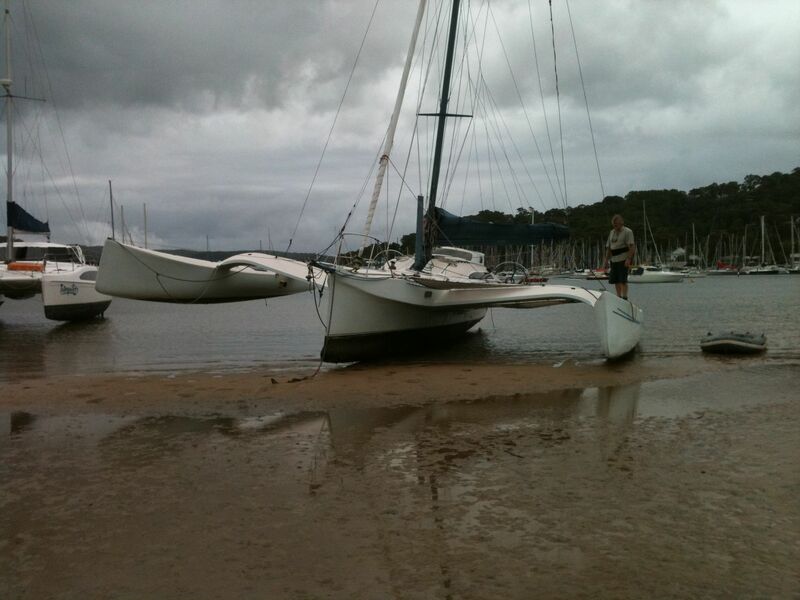 But these days its off limits to scrape anything off the hull or otherwise spoil the beach.